I had a moment of panic when I realized I forgot the premiere of Pushing Daisies was last Wednesday... then I remembered I could watch it online. Aaron got me the first season on DVD and he may regret it because I can watch the same episode over and over. 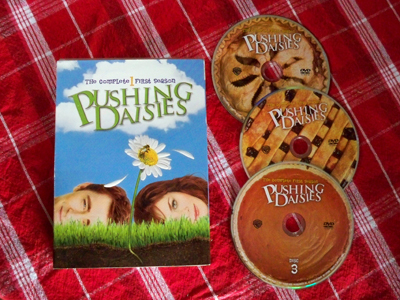 Gotta love how the DVD's look like pies! funny. we just started watching the first season from netflix. missed it on tv. so far, we like. My favorite show that's on right now! I just made mini-pies (cup pies) to celebrate. My husband, who is tall, and I just had a funny conversation about how he likes everything in the super large version and how I, the tiny person, like everything in very small versions. I guessed I had never realized before that I like little things because I am little.